Thank you for visiting Scripture Prayer for Healing. To fully understand the principles of praying scripturally, please read the teaching “Why Pray Scripture?” . Hearing God: As it is rare to hear an audible voice from God, one of the most common ways God will speak to us is through His written Word and a small still voice inside us. Before reviewing the scripture references below that address what the Bible says about healing, ask the Holy Spirit for His revelation to join you. When certain verses capture your attention more than others, meditate and incorporate those into your personal daily prayer life. I come before You in the name of Your son, Jesus, and I thank You that you are Jehovah Rapha, the Lord, our Healer. You are the same yesterday, today, and always. I thank You for the many ways You have supernaturally provided healing – through the laying on of hands, the anointing of oil by elders, through faith in believing Your Word above our circumstances and the gifts of healing and miracles. And you have also given man Your wisdom in medicine. I ask You to show me Your way out of sickness and into health today. Father, Jesus was always obedient to Your will and He is our example of who You are. Jesus always prayed for the sick to be healed. He told no one who desired healing that He would not heal them because they were too old, had sin in their life, or because they needed to learn something. Even when people were dead, He prayed for them to be resurrected and healed. Thank You that You reprove, correct, and train us in righteousness through Your word. So great is Your love, compassion, and desire for us to be well and to run the race You have before us that You included physical healing in the atonement. Your plans for us are for good and not for calamity. I thank You, Father, for the new covenant promises in Christ and that I am no longer under the curse of the law recorded in Deuteronomy 28, which includes all sicknesses. Thank you that Christ redeemed me from these curses when He paid the price for my sin on the cross. You are so righteous and just. You do not invalidate the work of the cross by putting sickness on Your children today. It is Satan who comes to kill, steal, and destroy; and sickness does all of these. I am so grateful to you Lord, Jesus Christ, who wrought so much for me when You suffered and died. You came to bring life. And now, as an heir and joint heir with Christ Jesus, my inheritance in You is the blessing of good health. You have said, “By Jesus’ stripes, you were healed” and I thank You, Jesus, that You took those stripes for my healing. It’s already been done. Lord, I cry out for discernment. Reveal to me the things that are unseen. Continue to show me the way out of sickness and the way to health. Expose the enemy and show me how to pray and receive the blessing of healing from You. Father, You “spoke” all things into being when You created the universe, and You said that we were created in Your image. 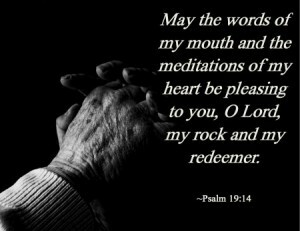 Therefore, life and death are in the power of my tongue, too. And Jesus, You demonstrated this when You walked the earth and did miracles with the command of your words. You rebuked fever in a woman and it left, and you spoke healing to all sicknesses. You even rebuked death from people. You took authority over the fever when you “spoke” to it. When the little boy needed deliverance and healing, You healed him and You have said, “The things that I do, you shall do also, and greater things than this.” I am created in your image and You are my example, Lord. I submit to you and I resist the enemy by speaking to him. You told the disciples that if they just had the faith of a grain of mustard seed that they would “speak” to the mountain and it would be removed. Forgive me for doubt and unbelief and remove it far from me, and help me to believe Your Word above what I can see and feel. I take up the sword which is Your word. Like You, Jesus, when you were tempted, I say, “It is written!” It is written that I was healed by Jesus stripes! It is written that believers lay hands on the sick and they shall recover! It is written that God wants me to prosper and be in good health, even as my soul prospers! It is written that whatever I ask in prayer I can pray and receive it! It is written that Jesus came to bring life and life abundantly! It is written that Christ redeemed me from the curse of the law which includes all sickness! Thank You, Jesus, that You are the living word! Now I rest in your arms, Lord. I know that it is with faith and patience that I inherit the promises. Your kingdom is at hand. I trust you to heal my body. I receive the power of the Holy Spirit to quicken my mortal flesh, and your gifts of healing to work in my body. I receive Your wisdom. Thank you, Jesus. I give you all the glory and thank You with all my heart. Your grace is truly sufficient for me. In Your mighty name, Jesus, I pray. Amen. Scripture Prayer for Healing was written to lift up and encourage the body of believers; sharing your testimony is one of the ways that we continue to overcome the enemy. If this teaching on Scripture Prayer for Healing has impacted your life, we invite you to share your testimony.